Ha, love it! To be fair, it may certainly be from a river in Eastern Europe! And it doesn't look like the typical instant-aging done with acid or oven cleaner. So it *could* maybe actually possibly be some kind of Victorian stage piece. It looks a little like the Brad Pitt helmet from Troy! Anyone else got better news? Eastern Europe isn't my strong point, and *did* have some things which look odd to us Westerners, so here's hoping! Thanks Matthew, to be honest, i haven't got a clue. Hopefully someone recognize the type. don't buy it. Fraud. Yes river finds often do look good. But this one has no damage at all. The patina looks different to a real river find. I have a old steel plate here which I pulled out of a river two days ago. That stuff is just black oxide. Not brown/rusty. It's riveted together from many pieces, which is kinda cool because people always produced trash and recycled stuff. But this one is just... nahh... don't get it. I don't trust it at all. I also don't know what type of helmet this is supposed to be. To me it looks like someone made a cheap helmet, threw it into some acid and let it rust for a few months just to sell it to the next guy he comes across. It's good to have fora like this with helpful people! Thank you very much! also ask yourself these questions: The guy is offering YOU a helmet. Why doesn't he offer it to a museum? Or sell it at an auction house, where the staff could judge the genuineness? Also consider that this helmet's appearance is vaguely similar in style to helmets from the Early Middle Ages. Such helmets are exceedingly rare, and I would imagine would have a starting price of $500,000 USD and up. If the seller is not asking you for a six digit figure, they're either monumentally ignorant as to the value of the item, or trying to scam you. I'm not saying it's an obvious fake, but the only way this thing could seem more fake is if it had a still visible stamp on it that said "Made in india" in comic sans next to a thumbs up emoticon centered directly on that widow's peak. They don't have any specific location of where it was Found? Just Western Europe? That's awfully vague. Every chincey bit of medieval metal plate or arrowhead I've purchased, I was given a specific location where it was dug-up (and I'm talking $20 bits and bobs). This is tantamount to someone telling you that they have an immaculate roman bronze statue that they'd like to sell you and when you ask them where they acquired it they say "it was an eastern Mediterranean find". Oh really! Do tell! The stories you weave are spell binding! Unless it was made for "Zippy: the human pin-head" it's not a "real" helmet. The front "widow's peak" creates an obtuse and flat angle to the back taper; creating a conical shape like a slouch cap. Is your head shaped like that? Do you know ANYONE with a head shaped like that? Lets not even mention the "ear" channels are too rearward towards the occipital bone. The ear canals of a human head (the external acoustic meatus) are almost exactly half way between the nasal bone and the back of the brain pan. 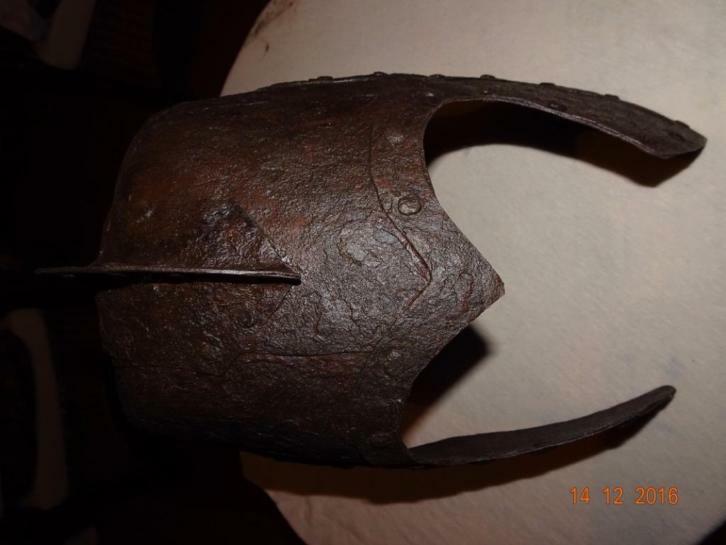 This poor design was also on the indian made replicas of the "Gladiator" helmet (which also is a very poorly designed dress piece but at least it was roughly head-shaped). Those occipital "murder-holes" as I like to call them, make a great place to aim a spear-point or poll to penetrate. As pointed out before, It could be an ill fitting costume piece where it didn't need to fit a head exactly to get the point across the imagery that "this is a soldier" across to the audience. The design seems intentionally "rustic". "I'm going to bang this into a helmet shape and throw 60 rivets on it with lots of reinforced edge strapping, to make it look like someone slightly more evolved than a cave-man could have made it." The reality is that Medieval helms do occasionally have a lot of rivets, but they are there for a pretty well-intended purpose (hold a liner strap, or fix a reinforcement plate, or lapping together), but I'm not aware of any helmets where the maker took a cylinder of flattened sheet steel then bent all the pieces in like a Christmas present wrap, and then used a dozen rivets to secure it all together at the top. I would call it lazy, but this looks like it actually took a lot more effort (and less planning) and exponentially poorer result than an experienced craftsman raising or dishing a piece to fit a head shape. Now, having said all that, let's turn our attention to the over-all condition. As described: despite having been buried for half a millennia in a river bed or bank it has no real discernible deformity on this piece. It has no damage or breakage. No major dents or fatigue cracks or deformity from a half tonne of mud and river water piling on top of it for 600+ years? Nature filled in the cavity of this piece so perfectly that it fully supported the weight of all of that? Okay. Stranger things in life occur. The widows peak may have been bent outward, half-explaining the pin-head affect, but it's pretty evenly bent outward. This I consider suspiciously ironic despite that having 1 completely symmetrical bend, without a single crease, even on the anachronistic comb or ends of the cheek plates are apparent. Very nice. I won't get into the specifics of why "river finds" are somewhat rare for metal objects." as I like the fact that forgers keep "finding" these excessively rare objects in magical rivers." Now, I would personally have gone with "It was found in a damp castle in a covered dry well", which is why it's uniformly oxidized, and yet at the same time bears zero damage from being on a river bank or struck by shovel when it was found. OR, conversely they should have beat it up and stepped on it a bit to give the appearance of having been sunk in a bog for hundreds of years and mauled by a digging machine. 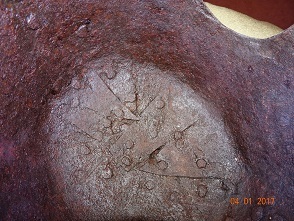 But fractures or cracks would further evidence the modern uniform structure of the metal. 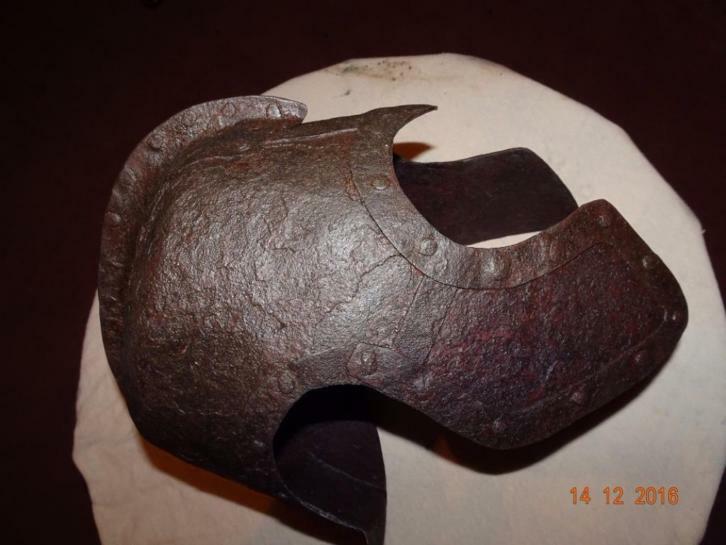 And who would want to buy a helm that looks like someone actually was dug out of the ground?! No one! Also notate the completely uniform oxidation without rust-through/pin-holes at any place? So the metal is obviously uniformly dimensioned and of such homogenous metal throughout the piece, (or at least so overly thick) that no area of oxidation could gain better purchase than any other area? Wow! Maybe it's Merlin's helm! It obviously has magical powers! I've some small bits of 400+ y/o chunky iron that are somewhat like this, but an item as large and voluminous, with an internal cavity such as a helm? I don't buy it for a second. So ignoring all of the apparent evidence; at first glance, without even having handled it; despite the non-human shape (and obvious rudimentary armoring skill due to all of the random rivets), we must come to the obvious conclusion that the manufacturer's metallurgical selection of iron/steel was impeccable! A more fun exercise would be to tell them you will gladly give them $50k for the helm (as you can flip it to a private collector a museum for twice that). You only have one request; they put it on their head displaying how it would have looked when worn. And even if they have a pin-head shape, and ears mounted rearward on their skull that makes the helmet actually fit (or set on a child's head), you can then ask them "and how exactly was this helmet secured to the head?" (since, even though the metal is all completely in tact, including all rivets still visible, there are no mountings or holes evident for a chin strap to pass through.) I surmise that it was placed on the head, and then lashed with several bindings of rope or duct-tape around and under the chin. I have a 4 qt sauce pan that would fit a human head better. With that shape, there is NO WAY it would stay on a human head, no matter how it was padded. If you do have the money to buy this, I happen to have in my possession a museum certified (eastern European) codpiece rumored to be that of none other than Charlemagne himself that I'd like to sell you. Images bear distortion from a cheap wide angle lens (I would say cellphone given the resolution and fuzziness). So proportions cannot easily be judged. Proper images taken witha a sharp normal lens would greatly help, if I discount distortion it might even be a good item. But an helmet that appears to be extraordinary in style and preservation state, with no provenance, is fishy, first and foremost because if it is legitimate it is probably also a product of illegal research, which spells legal troubles in case of re-sale on the legitimate market, and a lot of difficulties to re-sell it informally to dishonest collectors (there are .. and if you bought an illegitimate item and tried to get rid of it because of fear of legal consequences they would give you a pittance .. ). Second because, as it is well known, items without provenance being offered privately at an inviting price are almost invariably fake. I would ask for a documented provenance or pay it as replica at a low price, give it or take it. If I have to give my best guess about the provenance of this thing, I'd say early to mid-20th century prop for a "sword and sandal" film. It has a vaguely "Samnite" or Italiot Greek look but the details and general proportions look somewhat Art Deco.